Fruit; very large, oblato-oblong, angular sides. Skin; smooth, yellowish-green in the shade, orange next the sun, strewn with dark dots. Flesh; yellowish white, tender, juicy and sugary. ‘An apple of first rate quality suitable for dessert, but more especially for culinary purposes.’ Ripe between December and April. An excellent bearer. [HP pl.XVII/1878]. Described and figured in the Pomological Magazine. ‘This extremely valuable variety is little known in this country, but is in high estimation abroad. It is said to be the national Apple of Spain, where it is called Camuesar, and where it has been known from the highest antiquity. In America it appears to be called the Fall Pippin, — a name, however, which is applied to more sorts than one. In this country it is known both by the name of the Fall Pippin, by which it has been sold by Mr. Cobbett, and also by the erroneous appellation of the Newtown Pippin, and is, in fact, a very close approach to that rare and highly-prized variety. In quality it stands in the first class; its firm, rich, high-flavoured flesh, its beauty, and its capability of keeping, being scarcely exceeded. Its principal defect is its gigantic size; specimens have been ripened equal to the coarsest and largest kitchen Apples in cultivation. At the period of writing these notes (Jan. 20, 1830), we have specimens before us not only perfectly sound and in great perfection, but with every appearance of keeping a month or six weeks longer. There is no record of the period at which it was brought to England. From fruit exhibited to the Horticultural Society in 1829, by John Darby, Esq. it appears that very ancient trees of it exist in Sussex. It must not be confounded with the Holland Pippin, by which name it is called in America, and which has considerable resemblance to it. That variety, however, is distinct.’ [PM vol.3, t.110/1830]. 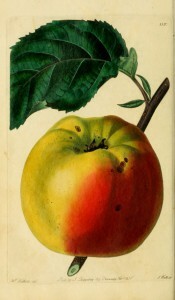 Listed in the 1845, 1850 and 1857 catalogues [Apple no.26/1845]. William Macarthur’s records contain one somewhat ambiguous reference to this apple. Good. Dessert only, not a desirable sort. [Notebook no.9, MP A2948].